Gogo Clamps, we offer, are one of the finest creation which is made of high-grade materials. These clamps are kept in line with the international standards and are endowed with much strength to work optimally even under the most demanding conditions. 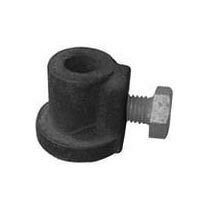 We are standing amid the leading Manufacturers, Exporters, and Suppliers of Gogo Clamps from Delhi, India. We can customize these clamps as per the client’s requirement.